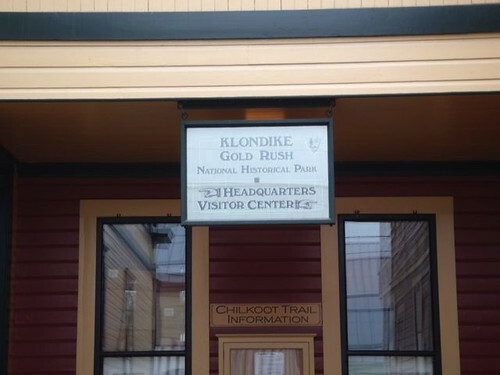 The Klondike Gold Rush National Historical Park in Skagway was the one and only thing Mik wanted to see in Alaska. It was not bad, but the museum part in Seattle is much better. However, the movie they show in the main visitor center building by the train station is pretty good. The Visitor Center is up on a raised platform from the street. You have to go up to it on a ramp from the side by the train tracks or back around halfway down the block on the other side. Not a big deal and they have signs to point out that it is the accessible way to the visitor center. However, it does mean you should cross the street by train tracks to go further into town without having to awkwardly cross mid street where there tends to be regular tour vehicle traffic. There is not really much to the Visitor Center. 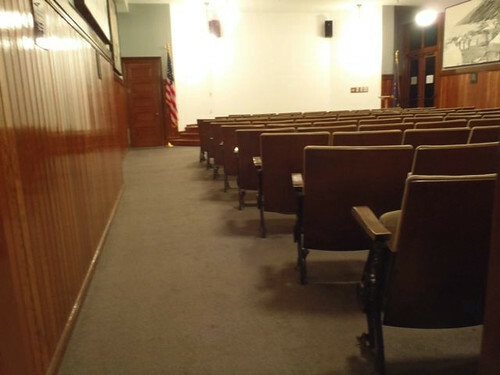 There is a room they show a 30 minute movie about the Klondike Gold Rush. The movie was totally worth seeing, but it is not well laid out for wheelchair access. You just end up with the wheelchair next to wherever you sit, which mostly blocks the aisle. 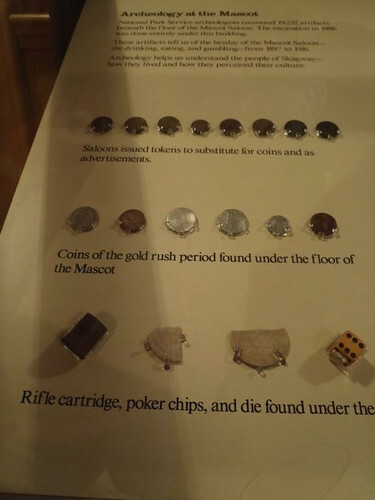 There is also a little museum next to the Visitor Center. This is well laid out with plenty of room to roll around, but there really isn't much in it, especially compared to the part in Seattle. It does have a cool look into a safe where gold was stored, though. 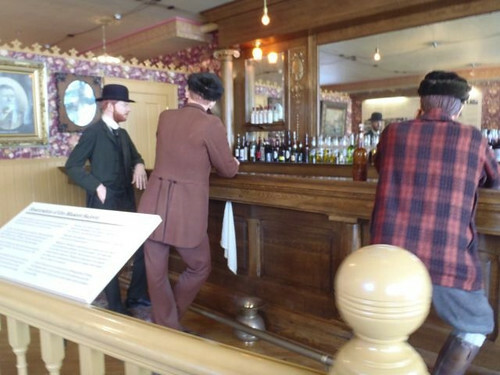 The most interesting part of the Klondike Gold Rush National Park in Skagway in our opinion was the restored Mascot Saloon a couple blocks further into town. This building is set up to look like the original saloon that was on this site. It includes some artifacts found under the floorboards during restoration. This building also has plenty of open space for navigating through no problem and the entrance was propped open, so even easier to get into than the Visitor Center. Of course, one of the highlights of the visit was stamping our 25th Anniversary National Park Passports, which we are using only for 2011. The Klondike Gold Rush National Park not only had the standard cancellation stamp, but there was also a 25th Passport Anniversary stamp and a special logo design Klondike Gold Rush National Park stamp.